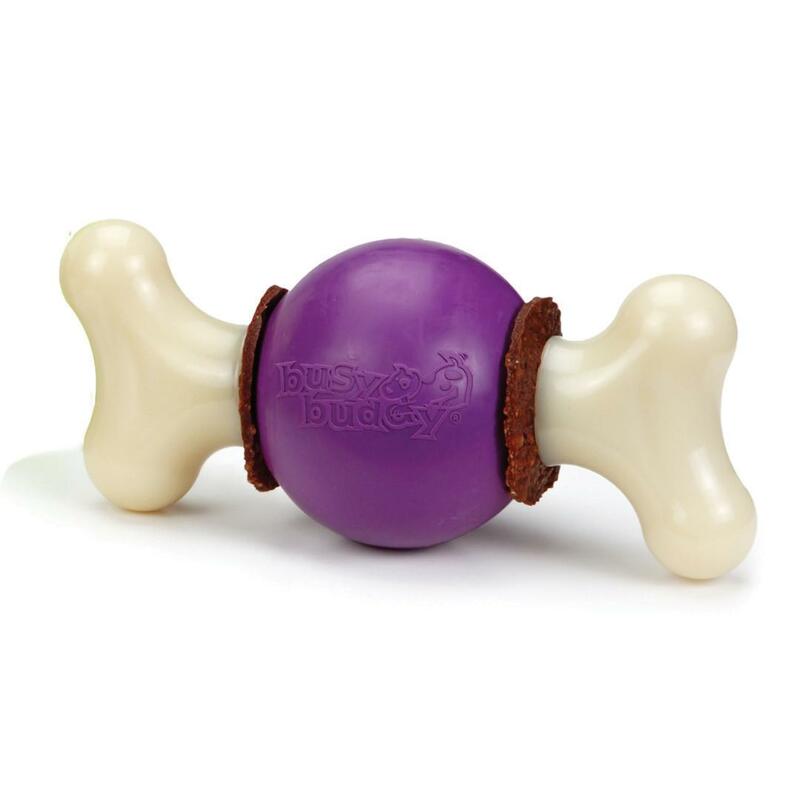 Give your active pup a fun time with the versatile and durable Busy Buddy Bouncy Bone Dog Chew Toy. 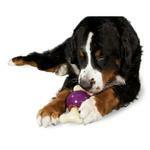 The Busy Buddy Bouncy Bone is 3 toys in one: nylon bone, rubber ball, and refillable treat-holding toy. 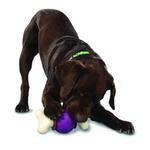 Made from durable nylon and natural vanilla-scented rubber, this toy was designed to satisfy strong chewers. 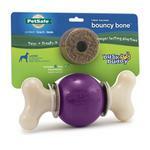 Treat ring refills reward good chewing behavior to encourage longer playtime. Available in sizes to suit most breeds. To use, unscrew the Bouncy Bone. Slide a treat ring onto either side of the rubber ball, and then screw the bone back together. Rawhide Treat Ring Ingredients: Rawhide, Sorbitol, Potassium Sorbate. Rawhide Treat Ring Guaranteed Analysis: Crude Protein: 50% (min), Crude Fat: 4% (min), Crude Fiber: 1% (max), Moisture: 15% (max). Great for old or young! Posted On 02/28/17 by marina g from plano, TX Yes, marina g recommends this product! 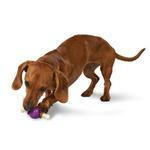 Perfect first toy for pups, teaching them solving skills for more advanced games and toys. Great treat toy to keep them happily occupied too. Posted On 01/26/17 by Donna from North Tonawanda, NY Yes, Donna recommends this product! I sent this to my "doggie niece" Molly. Molly is a mini Dachshund that loves to chew. She has destroyed almost ever toy she's ever been given.... she's two years old. This toy was part of her Christmas present. When her human mom gave it to her, she allowed no one to touch it! It gave her family an hour of laughs and peace. She just couldn't get the treats off of it! They have given her another toy that she has to get the treat out of, but she can get the treat out in 20 minutes. They are all pleased with this toy. Thank you so much for offering this item! Posted On 06/21/16 by Anna L from East Stroudsburg, PA Yes, Anna L recommends this product! Great for chewing! Keeps my dog busy for hours. Posted On 01/17/16 by Vicki B from Vashon, WA Yes, Vicki B recommends this product! This is one toy my puppy enjoyed so much that eventually we had to replace it and are on our second one now. I bought this first when he was little and I think he used it a lot for teething. After two years of gnawing on it, I bought him a new one because the "bone ends" started to get sharp edges from all his chewing. We threw that one out and are busy destroying bone # 2! He still really likes this treat bone. Posted On 10/03/15 by Karla H from Huntsville, AL Yes, Karla H recommends this product! My dog loves this with the treats! She has chewed it up a lot but it still is intact. Posted On 09/11/15 by Vicki B from Vashon, WA Yes, Vicki B recommends this product! Tucker loves this so much he wore it out and after two years we are on his second one. This is a perfect size for a Cocker Spaniel size dog. When the"bone" end pieces started getting pointy sharp edges from too much chewing, I threw away the bone part and kept the ball to play with. I have since replaced the Bouncy Bone because he really does like it. Once the "rings" are chewed off I take the bone away so he doesn't actually chew it up. A reusable treat toy that is a good investment if you don't let your dog trash it too quickly. Posted On 12/13/14 by Cookie Rodi from Cranston, RI Yes, Cookie Rodi recommends this product! Awesome My yorkie loved it!